The Falcon Cliff Lodge is an amazing house design with 4 bedrooms and 4 full bathrooms. It has 2,981 hsf (heated square feet). It is a 2-story residence with a nice loft, family room and other amenities. The Rand Soellner home architects firm is a post and beam designer with a solid track record of inspired house designs ranging from 390 sf cottages to 16,000 sf castles. This home is full-featured modest residence with lots of bedrooms and everything a house needs to enjoy living in a resort environment or suburbia. The dimensions work well for a wide house from left to right, and parallel with the slope down a hill or mountain. Post and beam designer Rand Soellner. A twilight view of his Falcon Cliff Lodge. (C)Copyright 2004-2010 Rand Soellner, All Rights Reserved Worldwide. 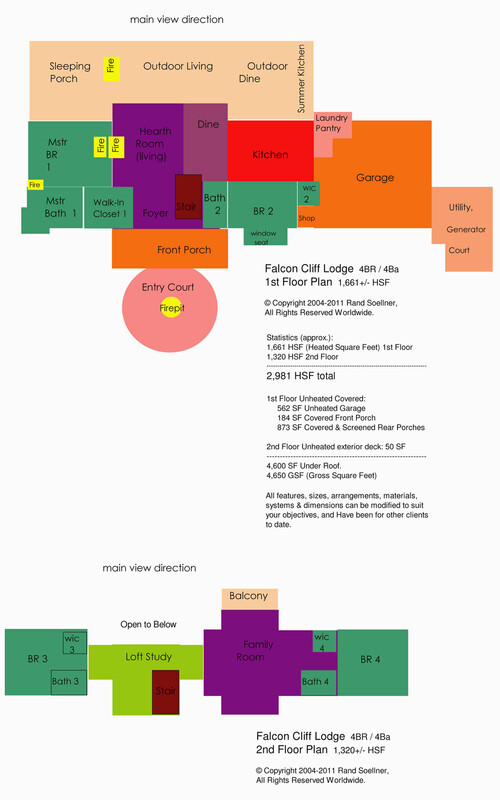 Wolf Lodge, Falcon Cliff Lodge II, Moose Lodge all have similar floor house plans, with main differences being garage entry, materials and colors. 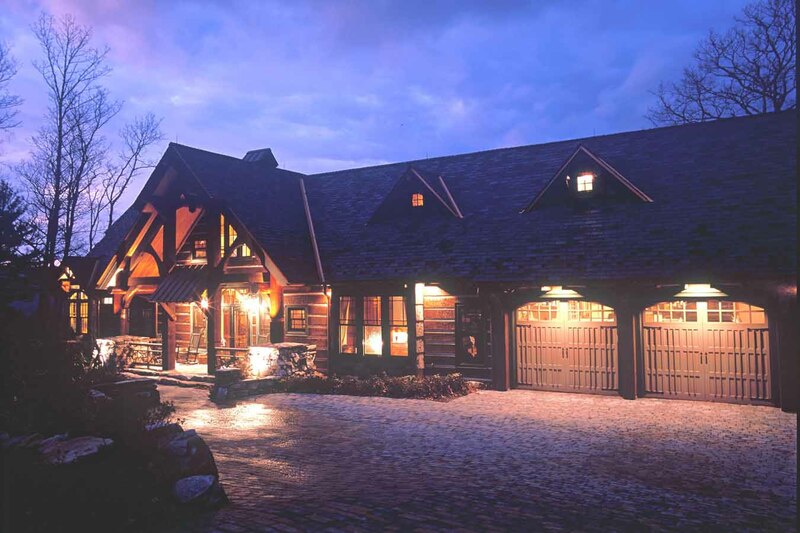 Post and beam designer Rand Soellner created this as the Genesis of his mountain lodge style homes. 1st Floor: 1,661 sf heated. 2 full bedroom suites, each with walk-in-closets and attached bathrooms. The Master suite features a 2-person shower, whirlpool tub with arched windows, separate His and Hers antique reproduction vanities and toilet room. The Master Bedroom also has its own fireplace. A view balcony is off the Master Bedroom. Also on the 1st Floor: Foyer, Great Room-Dining with massive fireplace, 2-story spacious window areas, nice Kitchen, combination Laundry-Pantry, large 2-car garage with shop, roofed and screened Outdoor Living Room with 2-way fireplace which also helps warm the Outdoor Dining, Rocking Chair Front Porch. 2nd Floor: 1,320 sf heated. 2 full Bedroom Suites (3 and 4), both with WICs and full bathrooms, Family Room, Loft, Stair. Post and beam designer Rand Soellner's imageable Falcon Cliff Lodge. (C)Copyright 2004-2010 Rand Soellner, All Rights Reserved Worldwide. This is the most popular model by a very experienced post and beam designer. 2,981 heated sf, 4,550 sf gross. 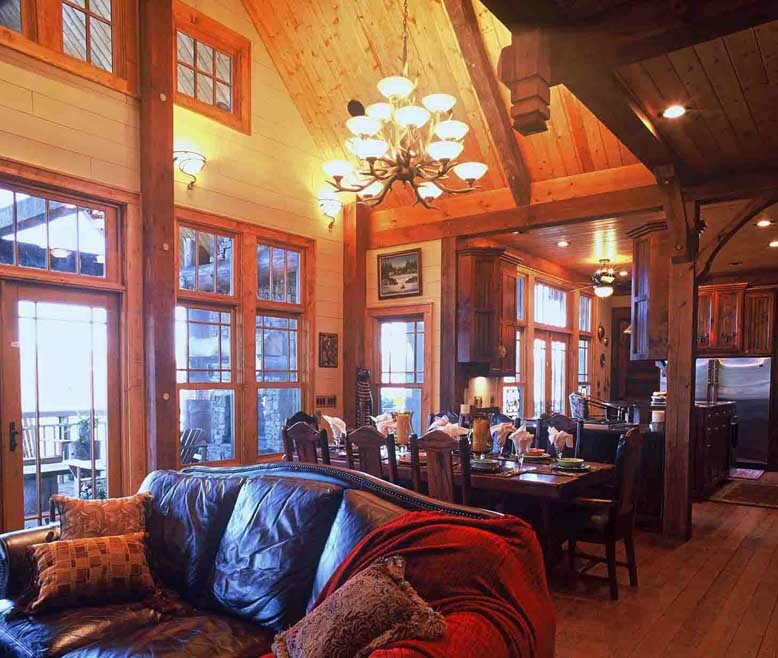 Award-winning mountain lodge home featured in multiple publications, including Luxury Log and Timber Frame magazine. Drawing status: complete construction documents. This is a very popular model, favored by speculative developers and homeowners in the Western North Carolina area. Main Level: 1,661 sf heated. Everything you want on the main level: Master Suite with Master BR 1, Master Bath 1 with whirlpool and separate toilet room, his and her vanities, 2-person shower, heated slate bathroom floor, fireplace in bathroom, fireplace in Master Bedroom, lots of tall windows, lovely master Dressing Room with 2nd small stack laundry hidden in cabinetry, Master rear porch. Great Room with stone fireplace surround, Dining space within Great Room, Foyer area and coat closet, lovely open arts & crafts style stair, Kitchen open to Dining area, with large granite island, state of the art stainless steel appliances, large Kitchen space with double-size 34 c.f. refrigerator-freezer, lots of cabinetry, 36” wide Dacor gas cooktop with downdraft, main laundry-pantry room, Outdoor Living Room with 2-way fireplace, Outdoor Dining Deck with stainless steel grill, 2-car oversize garage with shop, oversize garage doors and man-door, BR Suite 2 with bedroom, walk-in-closet 2, bathroom 2. Crawlspace: mechanical equipment, but if you want to build this out for a rec room or more bedrooms, you can. Post and beam designer received awards for this creation. This is an extremely well-thought-out design by post and beam designer Rand Soellner that has been graced with national appreciation and design awards. You can see more of it on the Rand Soellner Architect website: Falcon Cliff Lodge. There, you will see many photographs of the interior and exterior of this wonderful home. On this home, our architectural role can be interpreted as different things to different points of view: mountain home architectural designers, timber frame architects, post and beam architect, luxury home designer, log home design, custom home planning, Cashiers NC architectural design, Highlands NC architectural planning, Glenville NC home design. Post and beam designer Rand Soellner’s interior of his Falcon Cliff Lodge. (C)Copyright 2004-2010 Rand Soellner, All Rights Reserved Worldwide. The post and beam designer offers a working drawing set for this home. Detailed working drawing set has approx. 60 sheets of drawings, each 24”x36”. An incredibly detailed set of drawings for an exceptional post and beam lodge-style home. Designed by post and beam architects Rand Soellner. As a post and beam designer, Soellner creates timber frame style equestrian barns, workshops, castles, estate homes and humble cabins. There is also no end of hybrid combinations, as post and beam systems can fit in with just about any kind of home or project. The posts connected to the beam give a tremendous structural reinforcing for the main body of the home, if they are bolted to the conventional framing in a certain manner, which is one of this post and beam designer’s trade secrets. tags : post and beam designer, cashiers architect, Atlanta, Asheville house, post and beam, Highlands, timber frame, north carolina, greenville, charlotte, green, rustic, mansion, stone, boone, boston, lake lure, lake burton, destin.